I am sad to say but today’s post is the final installment in my 2019 Swim Week. But not to worry it is a special triple header post with 3 different suits to take you through the weekend till Monday. And then I have something really exciting up my sleeve which I will share more details on soon. All I can say is you better be ready! 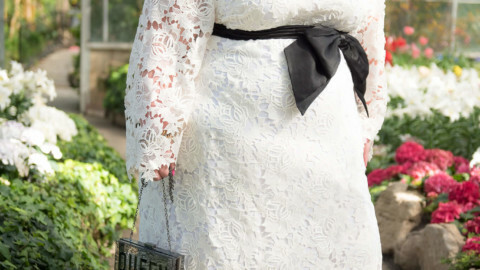 I don’t think it would be Swim Week here on the blog if I didn’t include Torrid. They have been my go to for swim for years, particularly when I was in permanent tankini mode. Special thanks to Torrid for sending me these suits to try. While the suits were gifted to me, all opinions are my own, as always, xoxo. I pretty much stalk the websites of my favourite brands on a daily basis as I am always looking to see what trends are coming out, new styles and just great pieces that I want to went to get and share with all of you. 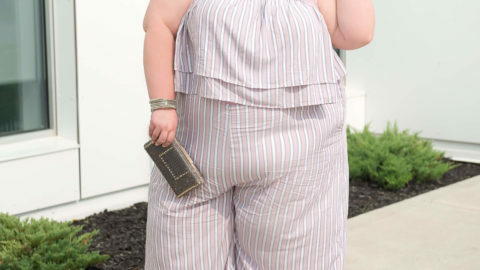 I am particularly stalker like when I know new swim collections are going to be released because often my size can sell out in the blink of an eye. And while there are a lot more options available in extended sizes then there was a few years ago, we still have some work left to do. So on one of my late night viewings of Torrid‘s website, I saw some new swim was starting to appear. I clicked on one of the tops I liked and I noticed something new. There was an option to choose your cup size! Now you should have seen how damn excited I was. That is because cup size has always been my biggest complaint when it comes to Torrid swimsuits. For someone who is an H cup, I always found they were small and I would size up in the top to have more room. But what I really like is that they didn’t make things complicated and change the sizing based on bra measurements which I can find hard with some other brands. Instead they created three categories – small cup, regular cup and full cup. I think for swim that is a pretty good variety as it doesn’t need to be an exact fit. Now technically based on the size chart the full cup only accommodates up to a F cup but I definitely felt that I had adequate coverage as an H cup. So don’t worry, there is definitely wiggle room. And if you aren’t sure what cup size you should get, don’t worry, they have a size chart posted on every suit that tells shows you your Torrid size, a range for the under bust measurement for that size and the cup sizes that will fit a small, regular or full. This was honestly super helpful and confirmed what I had suspected all along – the cups were too small for me. This option is only available on suits that have underwire built in and it is not necessarily an option for every suit Torrid currently has available, particularly if they were older styles. Always remember that something new like this is a big undertaking and they will phase it in over time. And if there is a style that you really love that you wish came in the different cup sizes then let them know! Brands take your feedback seriously and are always looking to make improvements based on your feedback. I decided to take 3 different styles of suits that Torrid offers for a spin so that you could hopefully find something that you would wear and to also offer as much feedback as possible. I know that shopping for swim suits can be daunting but it doesn’t have to be if you are well equipped with the right information. I chose not to feature a tankini because they are pretty easy to get a good fit on and a one piece because well hopefully you know by now that’s just not me lol. 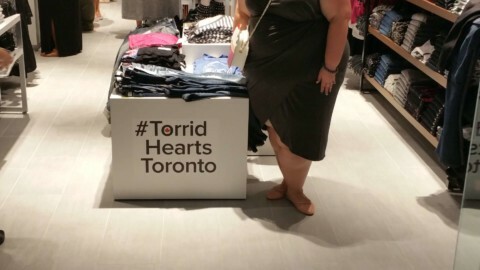 But not to worry, if you love these 2 styles, Torrid has a great selection to choose from. But in the end I have to say I really really love this suit. It’s beyond comfortable without any underwire and my girls still felt supported. I am wearing the size 4 in the top which should be my true size in a bikini top based on my under bust measurement of 46. For the bottoms I am wearing a size 5 which is my standard size for bottoms. I did notice that in this one the lining is less constricting than what I normally find with Torrid suits which I actually really liked. Overall, with the floral appliques the suit has a very boho relaxed vibe. I chose to have some fun with this look and up the glam factor by adding this black wide brimmed hat, some fierce sunnies and a pop of green in these earrings that are also from Torrid. Next up is this dreamy number in Pantone’s colour of the year, coral and wait for it – a rose gold mermaid pattern! Of course this was a must have purchase for me. I love the mermaid suit I already have from Torrid and having more than one is totally acceptable right? I think so lol. Torrid calls this style a “midkini” which is supposed to be a cross between a bikini and tankini top. I like that this top has underwire and provides the support of a bra. It also has adjustable straps that can not only be adjusted for height but also be adjusted in the back to make it a criss cross style if you wish. The little flirty peplum flounce at the hem is what makes this particular swim top special. It adds that feminine touch and bit of whimsy. Torrid. This look totally says beach vacation glam and I love it. Finally I went for a tried and true style that I love – a bikini top with a skirted bottom. I don’t wear a skirted bottom because I feel the need to cover up my thighs (quite the opposite actually!) but because I love the retro vibe it gives to a swimsuit and it is so flirty and girly. These teal floral suit was just so damn pretty and colorful that I couldn’t resist. There are so many different colours that you could wear with it. I am wearing the size 4 in the top with a full cup and the size 5 in the bottoms. I am realizing more and more that I prefer a regular bikini top and not a long line one. And it is simply a matter of practicality and aesthetic. They look great when you stand up but I find that as soon as I sit down, it rides up because let’s face it, I don’t have a flat stomach! So please make more regular looking bikini tops please. I simply roll up the bottom of the top so it doesn’t drive me crazy. my other wish is that they would make the skirt on the bottoms longer in the back so it doesn’t ride up on my booty. Because let’s face it, when you have a big booty it’s bound to happen. And I have plenty of room otherwise so its not that I need a larger size. I am still looking for the right cover up to complete this look so I just kept it simple and added these cute earrings from Torrid. Can you tell by now that I love these earrings? They came as a set of 3 and they are not too heavy and go with so many different looks. I totally feel like the new cup sizing is like this secret that is so good and the word needs to get out! If you decide to give one a try be sure to let me know what you think. I love when you guys send me pictures of you rocking all your looks. Each and every one of you inspire me daily so thank you. Well sadly that brings this 2019 edition of Swim Week to a close. If you have a particular brand you want me to feature on my next round up, leave me a comment. And don’t forget to tell me which suit is your fave. Or just leave me a comment to say hello. Till next time, Lisa xoxo. They are all so cute! You totally rock all of these looks but my favorite is definitely the coral mermaid one! It is just so pretty! Thanks so much hun! I love that one too, it’s so hard to choose! I love a skirt because I don’t like the tops of my thighs, how long was this one? I’m on the hunt for cute skirted non-grandma swimsuits!! Thanks hun, I looked online and it doesn’t give a length for the skirt but it definitely covered the top of my thighs and I am 5’6. Thanks!! You’ve encouraged me to take a second glance at the coral mermaid one too! Ooooh yes it is a must have!